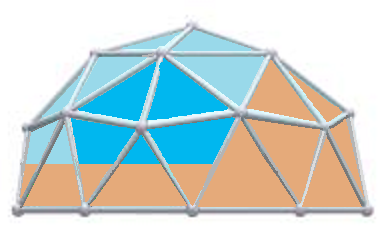 All-Season Domes are an alternative to the All-Season Houses. They are easier to heat due to the curved dome shape that circulates the air easily as well as always presenting a large surface area to the sun for maximum UV exposure. 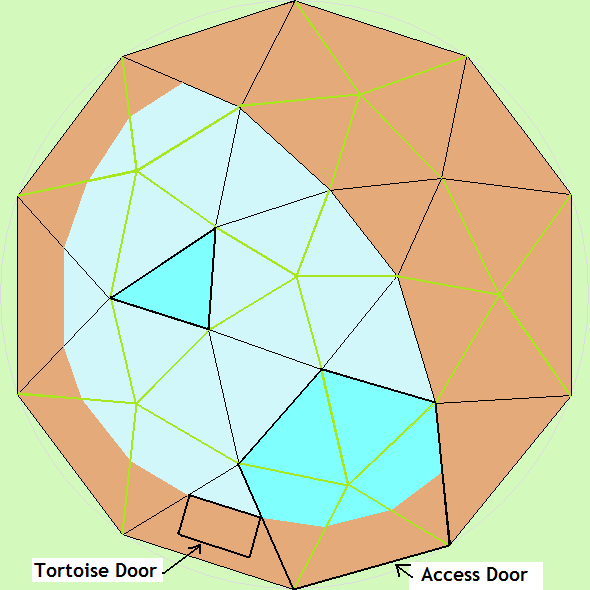 They are a great way to provide a large floor area and with their excellent insulation "U" values they can be adapted for housing all species of tortoises outdoors. The All-Season Tortoise Domes have a layer of TGV (Tongue and Groove Cladding) around the base of the walls to a height of 30 cm designed to restrict the tortoises' view to prevent stress. They can be placed on a low wall or directly onto the ground with the special plastic-covered lower frame adaptation. 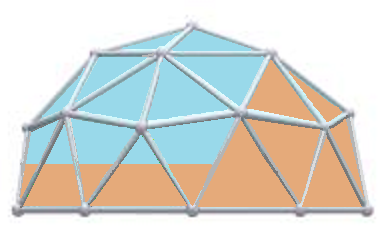 The Bird's Eye View provides a view of the whole dome from directly above. The window shown as the darker blue triangle can be fitted with a self-opening temperature-controlled bracket on request. The TGV clad panels shown in brown are fully insulated with Airtec Foil-Bubble Insulation and finished with WBP Plywood just like the All-Season Tortoise Houses. The large door shaded in darker blue on the above pictures is designed to allow full access to the house. The water bowls, heat lamp and UV can all be placed near this door. The heat lamp should be placed at the end of the hide nearest the tortoises' door. There is an internal wall that goes two thirds along the length of the hide so they have a cool hide corner too. The Electrical Installation, Electrical Packages and other Gadgets are available for these All-Season Domes here. Copyright © 2007-2019 Cosy Tortoises UK. All rights reserved. Product availability and pricing are subject to change. Product dimensions are approximate.